Entertain bathing children with these bathtub paints. This soapy paint can be used as finger-paint on the tub keeping kids occupied as you bathe them. They are scented with Grape Soda Fragrance Oil, which is an aromatic blend of rich grape, raspberry, sparkling club soda and sugar. Kids will love it! "Very cute for the kids"
COMMENTS: These are very cute products for the kids to play with in the tub. It is very messy to insert into the bottles, however. I was also disappointed in the size of the bottles. Not sure if I will purchase again...maybe if I purchase larger bottles separately I might. It's a good idea. COMMENTS: Easy to make kit. love the amount of colorant you get. I mixed them and made my own color combinations. the grape soda fragrance is spot on. It not only filled the bottles I had more left over to put into bigger bottles. I recommend this product to everyone its so easy. "Love it easy to do"
COMMENTS: Very simple to make. Love the fragrance. I ended up with at least enough "bath paint" left over to fill several more bottles. There was way more than enough shower gel and colorant supplied with this kit. COMMENTS: This kit was the closest i could find to what my favorite 4 year old wanted to "paint on the water". The smell is great. Even her 10 year old sister loves it. Make sure you have closeable regular plastic bags.I really love the sizes of the products. I can make other things with most of the kit items. Love that. • extra supplies to use on other projects. COMMENTS: This item is quick and easy to make. The kids love this product and it sells quickly! The scent that comes with this kit is spot on- Grape Soda! COMMENTS: What a fun project! The instructions are very clear and it's super easy to prepare. I even had left over paint that my kids took to the shower to test. Well, they loved it! Especially the scent. I recommend it. "How many ounces of product does this kit make?" Staff Answer It will make about 18.5 ounces of product. "This kit doesn't show ingredients, so how do you list the ingredients for Bath paints?" Staff Answer Good question! Sorry for any confusion. The kits will not list the ingredients on the 'Ingredient' tab, but the actual recipe will. If you look at the Bath Tub Paints recipe, under the 'Recipes' category, you will see the INCI Ingredient Label listing. This is the recipe you will receive when you order the kit. "what ages do you recommend these for? i made them for my young nephew but now im afraid that he might be a bit too young." Staff Answer No, there is not an age range we recommend for the paints. But if you feel he is too young, maybe pass on the paint. Bath Fizzies are great for young ones. If you wanted a multi color effect, maybe make smaller ones in different colors. "I did the project but did not know how to use it, do not have a video to show me?" Staff Answer The Bath Tub Paint can be something fun for children to do while taking a bath. Since it is made up of Foaming Bath Whip, Shower Gel, and Olive Oil they can paint the tub and tiles with it and it will wash off. 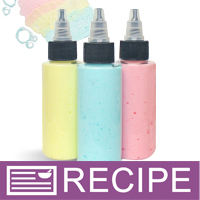 If you follow the directions in the recipe for the kit, you will come up with 3 different color bath tub paints.